“Reinventing the straw” might sound up there with “reinventing the wheel” as examples of things that don’t need to be reinvented. But when it came to their new Chocolate Shamrock Shake, the people over at McDonald’s didn’t feel like the standard straw was cutting it. 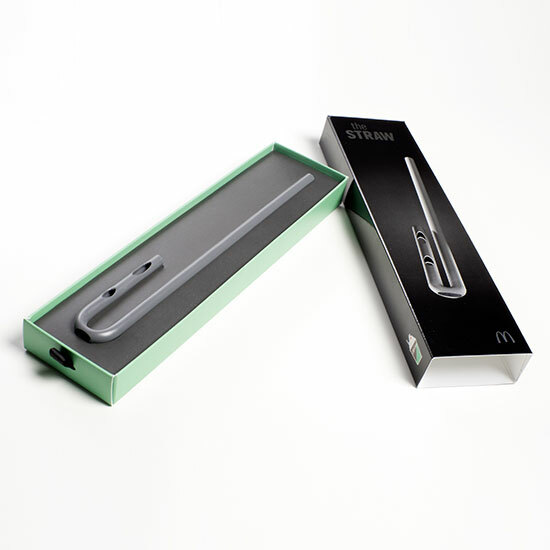 So they hired a team of aerospace and robotic engineers – professionals who clearly had more important things to do with their time (even McDonald’s called the project “utterly frivolous”) – to build a straw optimally designed for drinking this limited-time seasonal beverage. As we discussed earlier this month, McDonald’s decided to go bonkers with its St. Patrick’s Day-themed Shamrock Shake this year, expanding the green seasonal menu item into an entire line of five beverages. The headline-grabber of the group has been the Chocolate Shamrock Shake – a bottom layer of chocolate shake topped with a green layer of traditional Shamrock Shake. Think of it as a black and tan for teetotalers with no fear of diabetes. Now, as any consumer of layered beverages can attest to, these kinds of drinks can be tricky: Sip from the top, and you mainly taste the uppermost flavor; shove a straw to the bottom, and you’re only sucking on what’s underneath. So, as the company explains in a press release, McDonald’s endeavored to “deliver the ideal flavor ratio of 50% chocolate and 50% mint in each sip, versus enjoying each flavor separately with a traditional straw.” The burger giant (with, needless to say, plenty of money at its disposal) reached out to NK Labs and JACE Design – two companies who have worked for heavyweights like Google and NASA – and the “STRAW” was born. Though when reached for comment about whether the STRAW will ever see larger distribution, a McDonald’s spokesperson told me that “anything is possible for Shamrock season 2018!” So I guess we could also just be patient. Though waiting far less fun that wild speculation.